211 pages, 8.5" x 11"
The Tony Conigliaro Award is given each year to the MLB player who "overcomes an obstacle and adversity through the attributes of spirit, determination, and courage that were trademarks of Tony Conigliaro." Conigliaro was hit in the face by a pitch in 1967. His injuries were so severe that he did not return to the playing field until 1969, homering on Opening Day. Despite his dramatic return, Conigliaro continued to be plagued with vision problems and was forced to retire at age 30. Instituted in 1990 by the Red Sox to honor Conigliaro after his death, the award has been given to 29 players including Rocco Baldelli, Dickie Thon, Jim Abbott, Curtis Pride, and R.A. Dickey. The life stories of these players have been gathered in this book through the collective efforts of 27 authors and editors who are members of SABR, the Society for American Baseball Research. Professional athletes perform seemingly superhuman feats at work every day. While they possess extraordinary skills, they, too, must persevere through human struggles, both physical and personal. Many MLB players have overcome significant adversity, obstacles, and disabilities to achieve their dreams on the diamond. The 29 athletes who have been presented with the Tony Conigliaro Award offer inspirational examples of ballplayers who have overcome significant adversity to enable them to pursue their professional careers. Contributors include: Rich Bogovich, Ryan Brecker, Mark Brunke, Alan Cohen, Rory Costello, Gordon Edes, Greg Erion, Charles F. Faber, Eric Frost, Joy Hackenmueller, Donna L. Halper, Mike Huber, Norm King, Susan Lantz, David Laurila, Bob LeMoine, Len Levin, Scot Johnson, Skip Nipper, Bill Nowlin, Joel Rippel, David E. Skelton, Mark S. Sternman, Rick Swaine, Clayton Trutor, Saul Wisnia, and Gregory H. Wolf. E-book: Click here to download the e-book version of Overcoming Adversity: Baseball's Tony Conigliaro Award for FREE from the SABR Store. Available in PDF, Kindle/MOBI and EPUB formats. Paperback: Get a 50% discount on Overcoming Adversity: Baseball's Tony Conigliaro Award paperback edition from the SABR Store ($10.99 includes shipping/tax). E-book: Click here to purchase the e-book version of Overcoming Adversity: Baseball's Tony Conigliaro Award for $6.99 from the SABR Store. Available in PDF, Kindle/MOBI and EPUB formats. 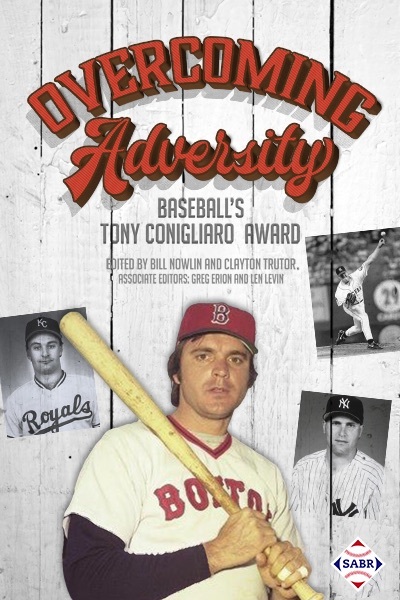 Paperback: Get the paperback edition of Overcoming Adversity: Baseball's Tony Conigliaro Award from the SABR Store ($20.99 includes shipping/tax). This page was last updated October 31, 2017 at 3:55 pm MST.